A radiator is a heat exchanger that radiates heat and transfers it to the surrounding air. In the case of a combustion engine such as the one that is in your car, the engine heats up as it runs and "gives" its heat to the radiator which, in turn, gives it to the surrounding air. It does so through coolant (anti-freeze) that is circulated through the engine. The coolant heats up as it passes through the engine and cools down as it passes through the radiator, keeping the engine at an optimal temperature. Why do I need a radiator? The radiator is one of the most important components of a car for many reasons. First, an engine that runs cool runs more efficiently and more cleanly, it lasts longer, and it is less susceptible to wear-and-tear. On the other hand, overheating is the worst thing that can happen to your engine. It may lead to a blown top-header, a completely blown radiator, a blown head gasket, or it may permanently seize your engine altogether. As the engine heats up, its components expand and begin to rub against each other. The increased friction between engine components creates even more heat, much like the heat generated by rubbing your hands together when they are cold. Eventually, if the engine temperature does not drop, the components will literally melt onto each other and the engine will seize. What are the components of a radiator? There are two main components to a radiator: the core and the headers. On automotive radiators, headers can be made of three different materials: brass, aluminum, and plastic. As for cores, they are usually made of copper or aluminum. 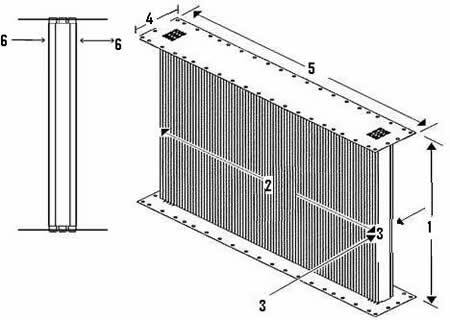 The core of the radiator is composed of tubes and fins. At each end of the core are the headers (often called "tanks") which include an inlet/outlet for engine coolant, and sometimes include a transmission oil coolers and/or an engine oil cooler which is inserted inside one of the headers. To cool down the engine, hot coolant flows from the engine into header via the inlet and then cools down as it circulates through the tubes to the opposite header and cold coolant exits back into the engine via the outlet and the cycle is repeated. 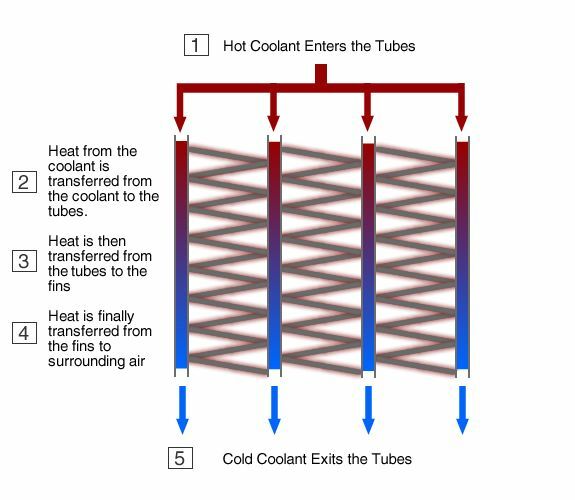 As it circulates through the tubes, the coolant transfers its heat to the tubes which, in turn, transfer the heat to the fins that are lodged between each row of tubes in a zig-zag pattern. The fins then radiate the heat transferred by the tubes to the surrounding air, hence the term radiator. Engine oil coolers and transmission oil coolers function the same way. They sit inside the header where coolant circulates and the heat carried into the coil of the cooler by the hot oil is transferred to the coolant outside the coil and is dissipated as it circulates through the core of the radiator. A great way to understand this process is to think of the heaters used in our homes. The same principle of heat transfer is used by almost all types of heaters. The only difference is the goal to be achieved by the transfer of heat. The goal of a heater is to warm up the surrounding air by transferring heat from the tubes (or electrical wires if the heater is electric) and fins of the heater to the surrounding air, thereby warming it up, while the goal of a radiator is to cool down the tubes and fins (and the liquid inside) by giving up their heat to the surrounding air and cooling down as a result. Bolt On Cores: Due to the many different fin configurations and core sizes, it is necessary to speak with one of our specialists to ensure we quote the proper core for your equipment. 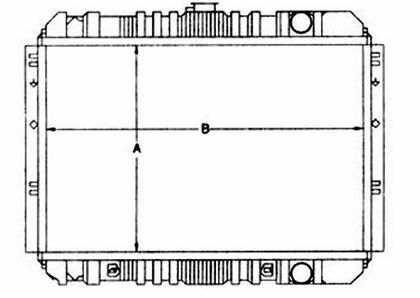 At right is a diagram of a radiator core depicting the six areas to measure. Once you have these measurements, call us to speak to one of our core specialists. Core Height (A) - This measurement is always between the two tanks from header to header or we can say on the length of the tube. Core Thickness (C) - This measurement depends on how many tube rows are present in the radiator. An easy way to measure thickness is by inserting a wire through the fins until flush with the core. Mark the other end of the wire and measure the wire. 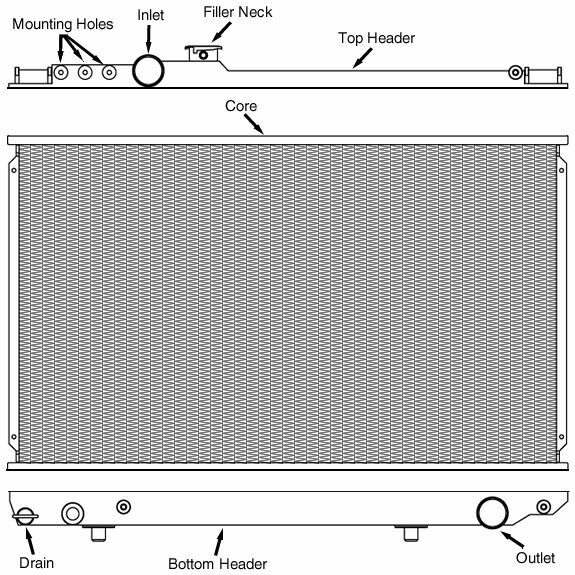 The downflow radiator is designed so coolant flows from the top tank to the bottom tank. What does a radiator fan do? Air is an important part of the heat transfer process since it takes the heat away from the radiator. Without getting too involved with physics and thermodynamics, let's just say that air heats up relatively quickly and that in order for the radiator to continue to transfer heat to the surrounding air effectively, the heated air must continuously be replaced by cool air so that the heat transfer process can continue. That's why the radiator is located behind the grill at the front end of the car. As the car moves, air flows through the radiator and continuously "takes" away heat. However, when the car is not moving or when natural airflow is insufficient, a fan pointed directly at the core forces more air through it and more heat is transferred. What is the difference between a copper/brass radiator and a plastic/aluminum radiator? Most recent regular radiators are built with plastic headers and aluminum cores, while the slightly older ones are built with brass headers and copper cores. A common question when it comes to construction is which radiator is better: aluminum or copper? The answer depends on what you consider to be better. Both have advantages and disadvantages related to the conductivity of the metals, the conductivity of the different types of soldering used to bond fins to tubes, overall weight of the radiator, thickness of the core, resistance to corrosion, thickness of material used in tube construction required to achieve equivalent resistance to pressure, etc. In the last decade, plastic/aluminum radiators have extensively penetrated the OEM market so that most of the radiators found in recent cars are plastic/aluminum. What is the difference between a racing radiator and a regular radiator? The differences between regular radiators and racing radiators are vast. The most obvious difference is that racing radiators are all-aluminum, meaning that the headers, the tubes, and the fins, are aluminum. Complete aluminum radiators are resistant to much higher pressures (the hotter the coolant, the higher the pressure), they are lighter, stronger, and can handle very hot high-revving engines for extended periods of time. In other words, they can endure a level of abuse that conventional radiators cannot. The way in which they are constructed varies from manufacturer to manufacturer. Some manufacturers use higher grade aluminum and higher grade solder. Welds can be heli arc or tig and the quality, smoothness, and detailing of the welds vary. Some are brazed in state-of-the-art furnaces to bond all materials while others are not. The type of radiator that is most suitable for a car depends on how that car is driven. Track cars that run extremely hot for hours at a time, weekend after weekend, should be protected with a high-quality radiator. A heavily modified street car that doesn't necessarily take the same level of constant abuse as a track car only requires a mid-range radiator that looks just as beautiful under the hood of the car but costs much less. So the answer to "which type of racing radiator is most suitable for my car?" is very simple: it depends on what you do with your car.